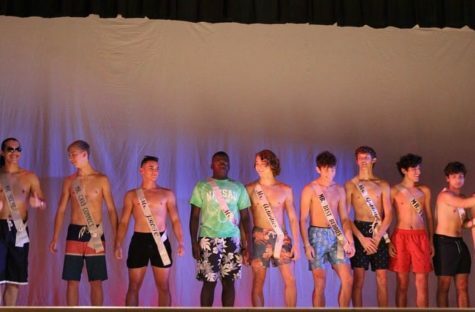 The male pageant of Mr. Coral Gables was held last week, which resulted in a tie between the two male contestants. On Friday, December 20th, the annual Mr. Coral Gables pageant was held in the schools auditorium The show allowed gave male upperclassmen the opportunity to show off their talents for Gables alumni to evaluate. It began with 24 contestants to eventually narrow down to the top five. Although usually only one winner is proclaimed, this year proved to be a notable exception with the competitions first tie. The school’s nationally-ranked dance team, the Gablettes, performed during an intermission. The top five included Mr. JROTC (Juan Toranzo), Mr. Activities (Alfredo Wolferman), Mr. MUN (Christian Ochoa), Mr. Cavsconnect (Trey Riera-Gomez) and Mr. Best Buddies (Thomas Harley). The top five contestants were then narrowed down based on their talent performances and a series of questions asked by the judges. These events then led into the announcement of the winners for best talent, Mr. Congeniality and Mr. Coral Gables. Best talent was awarded to Christian Ochoa and Mr. Congeniality was awarded to Udeme Ekpo. However, when it came down to the selection of Mr. Coral Gables, the announcer paused as the drumroll played in the background. After a brief moment of tension and silence, the first tie in the competition’s history was announced. As two of the contestants gave outstanding performances, the judges could not narrow it down to just one choice The two winners announced were Mr. JROTC and Mr. Activities. Both winners have contributed greatly to the school. Senior Juan Toranzo represented his program as the Battalion Commander for the Junior Reserve Officer Training Course. Aside from that, Toranzo is a member of several clubs including NHS and Cavalier Singers. Toranzo has been in JROTC for his four years at Gables motivated to lead his battalion to honor the school’s pride. “In Mr. Coral Gables, I wanted to represent my program and what it stands for. I’ve learned to lead by example and I want to leave a legacy behind in Toranzo is also the first student in JROTC to appear in the pageant leaving a memorable mark on both him and the program. Not only was he the first to appear in the show, but he won both fan favorite and Mr. Coral Gables. As he has enlisted in the United States Marine Corp., he wanted to leave one last mark on the school before leaving in June. Through Mr. Coral Gables, Toranzo believes he has shown great dedication and spirit to represent his program and his school. Along with Toranzo, the other winner of the pageant has also shown a great contribution to the school along with being humbled to win the shared male title of the school. The competitors showed off their attire during the swimwear section of the competition. “Honestly, it’s an amazing feeling to share the title of the school with Alfredo. Not only that but all the guys in this show along with the bonds we made are what made this event one to remember. Overall, I am humbled to be a part of this and honored to perform with all the guys I met” Toranzo said. Senior Alfredo Wolferman represented student activities in the show as senior class president. Aside from that, Wolferman is a board member of many clubs including Best Buddies and Interact as well as being captain of the swim team. Wolferman had an outstanding performance, which determined his win. His performance and answers to the judge’s questions exposed his love for the school as he would shout “I love you Gables” in every scenario possible. “I initially applied for Mr. Coral Gables excited to compete with my fellow classmates and possibly be crowned at the end of it all. Even if I was not going to win, the best part of the show was definitely the dance preparation as it brought all of us closer together. In the end, I am extremely honored to have been crowned along with Juan and am super excited to represent our school as Mr. Coral Gables” Wolferman said. The show brought in a series of talent along with the great surprise of a tie. Both Toranzo and Alfredo are honored to now represent the school as a male face for their programs along with Gables’ spirit. 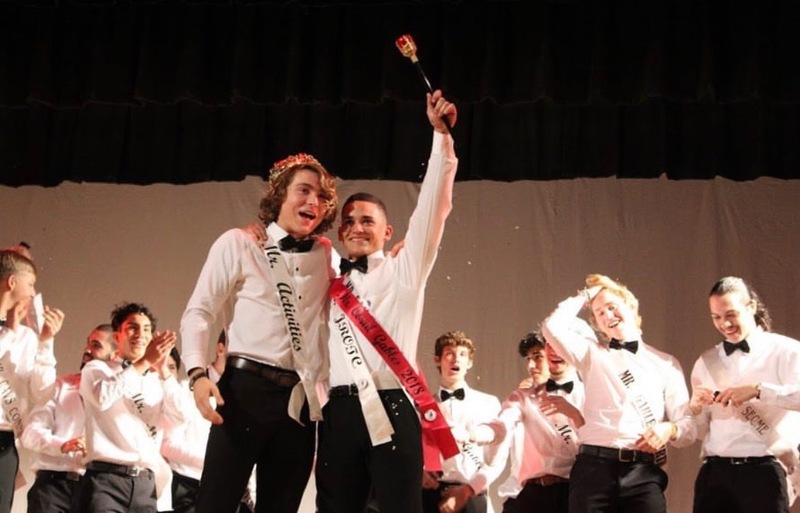 The pageant will be a hard one to top for the upcoming years as it broke records leaving a legacy for the strapping young men of the class of 2019.